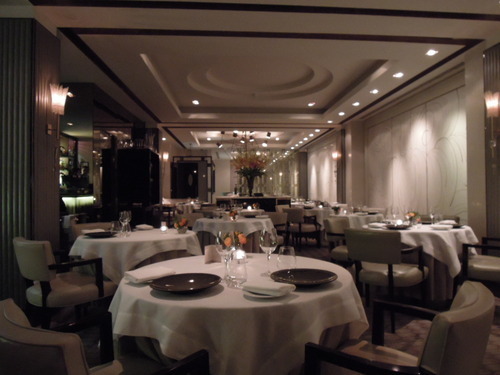 Murano by Angela Hartnett is Angela Hartnett’s Michelin two-starred flagship restaurant in London. Angela, who is Gordon Ramsay’s protégée, is also famous for her Guardian column and her appearances on the BBC programme, Great British Menu. As always, I am the biggest protagonist of Italian cuisine. I was initially not too desperate to visit Murano, as I generally prefer more rustic, rugged Italian meals such as a pasta dish with a glass of cheap Italian red. However, having visited many different restaurants in London featuring Modern European or French cuisine, it was about time I visited a proper Italian fine-dining restaurant. 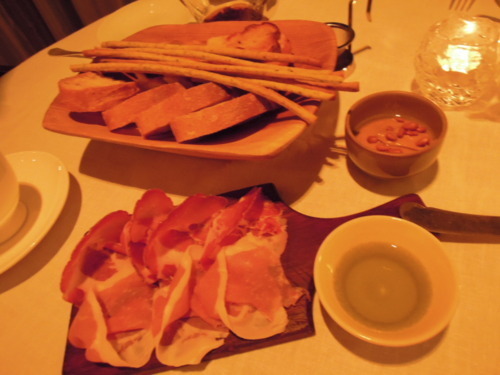 (1) We delved straight into the Grissini, bread and ham. The ham was beautiful, and we particularly adored the smokey hummus dip which gave an oriental twist to the bread basket. (2) Panzanella or panmolle is an Italian salad of bread and tomatoes, typically dressed with olive oil and vinegar and sometimes includes onions and basil. 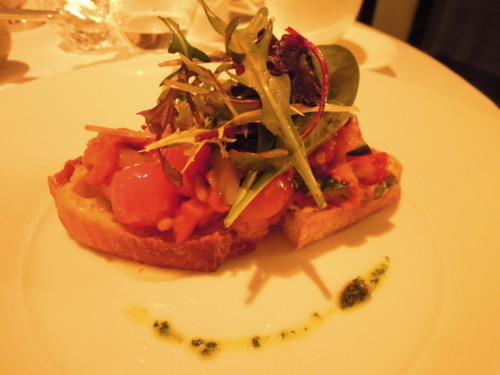 The Panzanella, Courgettes, Tomatoes, Sour Dough was perceptibly fresh, and the tomatoes and courgettes were incredibly succulent, but for a Michelin two-starred restaurant this dish did not blow our minds. 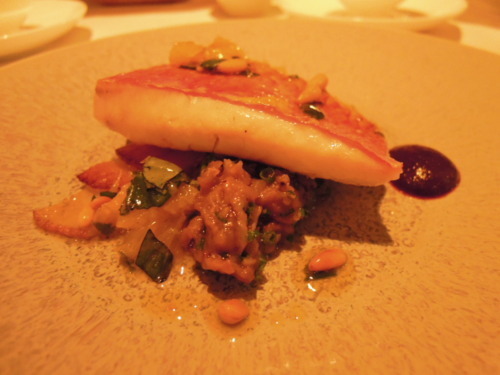 (2) The Red Mullet, Black olive, aubergine caviar, orange vinaigrette was tender and indulgent, and had an explosion of different flavours from the olive, aubergine caviar and orange vinaigrette. This was one of the best dishes of our meal! 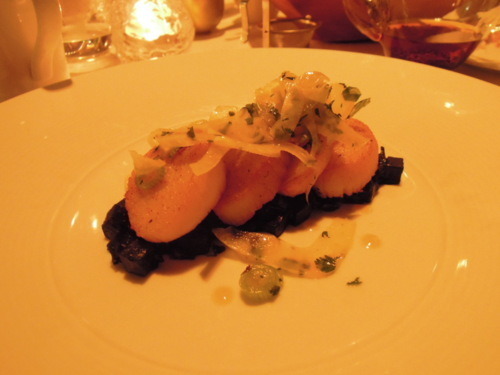 (3) The Scallops, Cuttlefish “risotto”, apple, fennel which followed was also sublime, with the Scallops cooked just right and the texture outstandingly pleasant. 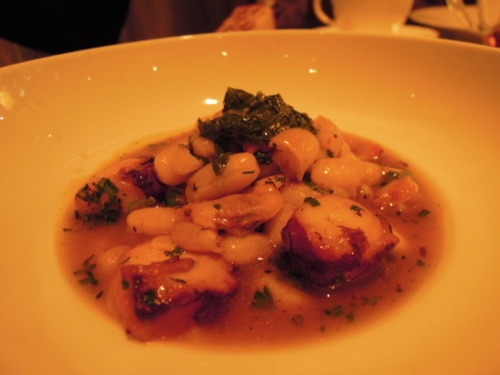 (4) I adored the Octopus, Apple purée, white bean and clam ragout, as the octopus was fresh and chewy and was marvellously matched with the accompany white beans. The dish had a mélange of textures from the different ingredients, and felt strangely familiar as it brought Japanese sashimi to mind. 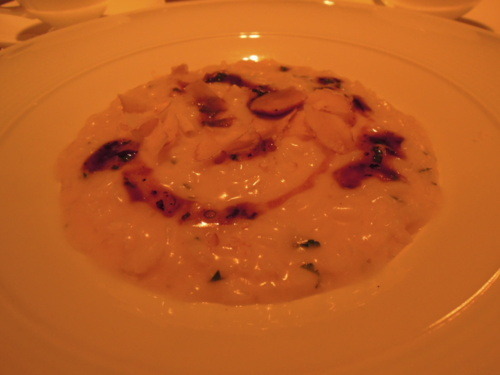 (5) I have tried risotto at many restaurants (see The Glasshouse, The Pawn, aqua roma, aqua tokyo & aqua spirit, Cecconi’s Italian), and this Chestnut, Carnaroli risotto, truffle vinaigrette was one of the best risottos I have ever had. It had an impeccable, creamy consistency and spot-on taste, unlike many other restaurants which produce a soft, bland version of it. The touch of sourness from the truffle vinaigrette beautifully cut through the richness of the risotto. 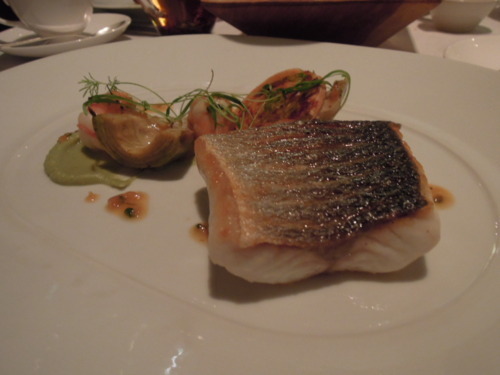 (6) Perhaps it was our fault for ordering so many fish dishes, but the Sea bass, Fennel purée, baby artichokes, Scottish langoustines and the Monkfish, Creamed chicory, chicken wings, Spanish paprika did not excite me and my friends anymore. While the fish was succulent and both dishes were delicate and scrumptious, we needed something more remarkable and extraordinary to be impressed. Conclusion: We adored the dignified, serene setting of the restaurant, the warm and welcoming service and the impressive food. What was also commendable was a separate, comprehensive Vegetarian menu, which my pescetarian friend R found really useful. 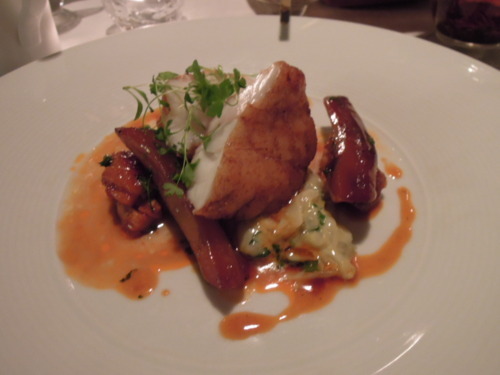 However, our 3-course dinner came to about £80 per head (excluding wine), and on hindsight, the meal did not justify that price, nor did it live up to the expectations we had for such a high-profile chef. Perhaps the hefty bill explains why the restaurant was filled with affluent-looking old couples when we were there. If you have a limited budget but would still like to try Angela Hartnett’s cooking, you should go for their set lunch which only costs £30!